Happy Monday, we made it through the weekend! 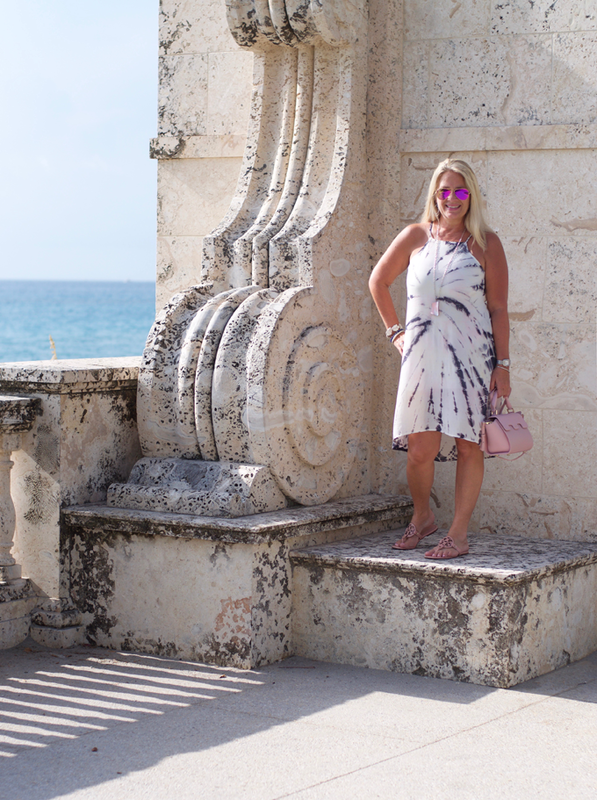 As my vacation was coming to an end, we attempted to visit all the favorite spots in and around Palm Beach. Worth Avenue being one of these spots. The shopping is comparable to Rodeo Drive; just with prettier views of the ocean in my opinion! All of your high end designer shops are on Worth Avenue as well as some darling boutiques. I actually love the small boutiques and what you may find that is not as easily spotted on so many other fashionable woman. This dress is a boutique find. I spotted it in the window and dragged Gayle in and she agreed it was darling and looked like me. I love the print somewhere between a tie dye and a batik. If you remember before I left on my trip, I shared my new Mezzi Cosima bag on my instagram, (follow me on instagram here if you don't already) and all the features this little cross body holds. Like a blue tooth for your phone, and a mini speaker to play your music. It even has a light inside to see in dimly lit locations. But what makes this bag the coolest is it's ability to fully charge your phone up to three full times! So if you're running low on juice because you have snap chatted the entire evening.... (we did several times) no worries, just plug your phone into your bag on the go and charge up! I have been a fan of the entire Mezzi line for a while now so to finally own one is awesome!! I now want to have the Mezzi Carezza bag too!